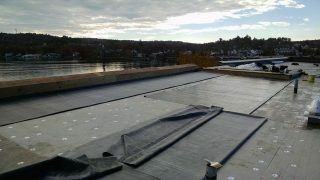 Welcome to Viking Roofing Inc.
Large slate project at the University of New Hampshire in Durham, New Hampshire. Completed in late September 2017. This is a cedar shake job completed during the first half of 2017. 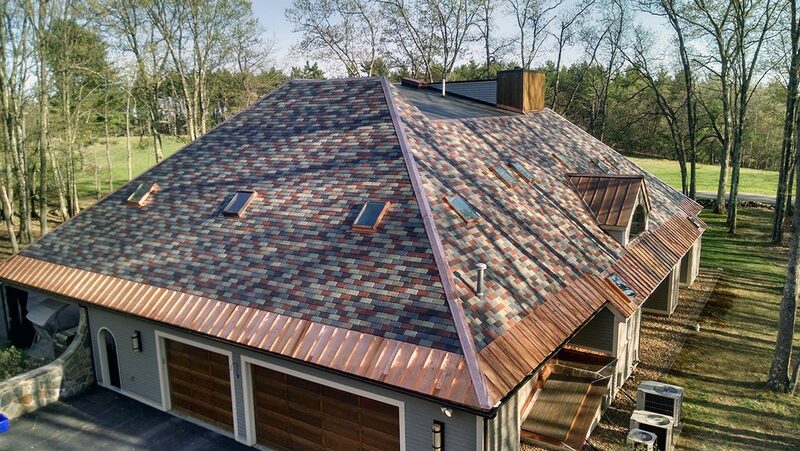 The job included the fabrication of custom copper flashings that we made in-house as well as the installation of hundreds of cedar shakes that were nailed in place by hand. We completed this job up at Pat’s Peak during the first half of 2017. It included the installation of new metal panels on one of the ski lodges. Our goal is your complete satisfaction now and for the lifetime of your roof. Servicing New Hampshire, Massachusetts, Maine, Connecticut and Rhode Island. Your project represents the best in residential and commercial development. 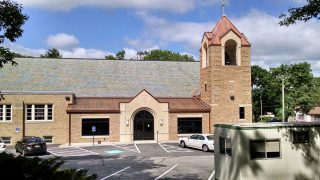 As a commercial property owner or manager, you recognize that a superior roof protects not only your investment but your vision: the highest quality homes and offices for discerning clients. As a discerning consumer, you want a roofing contractor who appreciates the value of your home and your time. You want to preserve your historic building for generations to come, and that requires a solid, dependable roof. Long after your roof is installed, maintenance and repair services keep it strong and protect its integrity. 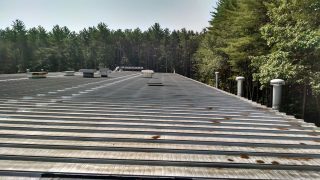 Viking evaluates your building’s roof and abutting structures to find and fix the true source of any problems—and save you costly renovations down the road. – Kevin Slattery, President, Etchstone Properties, Inc.
– John Kendall, Managing Partner, JS Kendall Custom Builders, LLC. Flat roofing is what we do best. 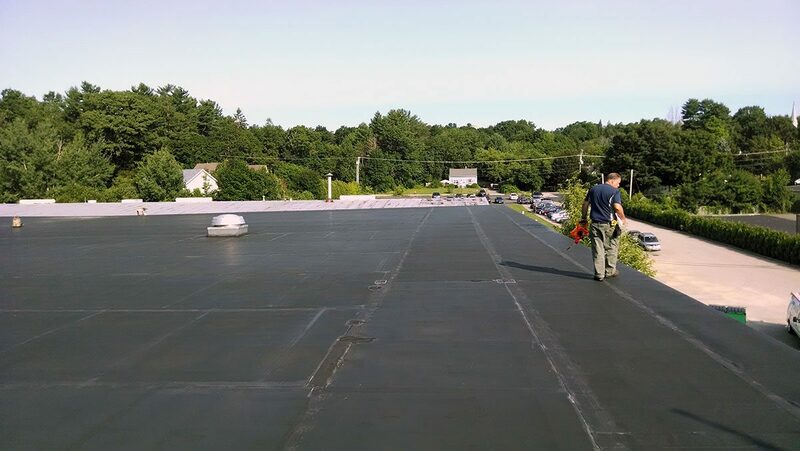 Our men are highly trained and experienced with every type of flat roof. Whether installing a new system or repairing an existing one, our employees will manufacture an assembly that is both watertight and built to last. Viking also consistently stays aware and informed of new systems so that it is ready to install them when the time comes. We also excel at crafting decorative work for residential homes and restoration projects. 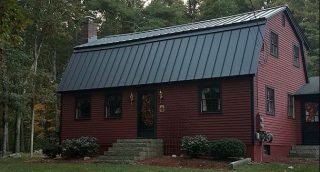 We fabricate our own copper drip edge and flashing in-house. We have the tools and the skill to complete each unique job with custom details that are not only watertight but also look excellent. Viking believes that quality of work is what sets it apart from other companies. It supplies and installs the highest quality products, so that each assembly is watertight and has the durability to last. Its employees are highly trained and professional. Each project is assessed and planned prior to the start date so that the team will know what needs to be done from the start. Each project is supervised by a highly capable foreman who has spent many years in the industry. We’re there for you anytime you need us. Call the office for a consultation, estimate, or any question you might have about your roofing needs. You can also submit a request for an estimate through the website! Viking believes that a happy customer is an informed customer. Viking prefers to communicate with customers in order to build them the roof that will suit their needs. But most importantly, Viking wants those customers to understand what will be installed, and why it is the best option.